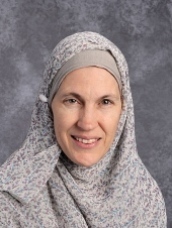 Ms. Ann Raheem has been teaching at Al Fatih for the past 8 years, most recently in Grade 3. She has always loved social studies and is very excited about being able to focus on that content area this year as our middle school social studies teacher! Ms. Ann has a master’s degree and certification in Teaching English as a Second Language and she is certified in Elementary Education and Highly Qualified in Social Studies. She taught various social studies classes before in Colorado, such as US government, geography, and US history. In her spare time, Ms. Ann enjoys spending time with her family, which includes two AFA students and various extended family members in the area and beyond. She also likes to do zumba whenever she can fit it into her schedule. She looks forward to helping our middle school students be prepared for high school, inshaAllah.